I’m not a “I really gotta meet this guy” type of person but you find yourself in situations with these very people that had a huge influence on your musical life. 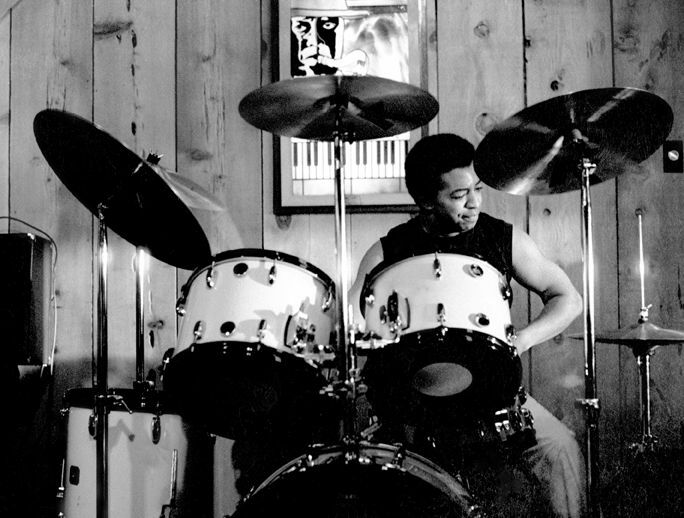 In my opinion, Tony Williams is the most creative and influential jazz drummer of our time. We’ll talk about the reasons in another post. But we opened for Tony’s quintet (Billy Pierce, Charnett Moffat, Mulgrew Miller, Wallace Roney) in Newport RI sometime in the early ‘80’s at a now defunct club called the Blue Pelican. I walked into the club about two hours before the gig and there they were – Tony’s signature Yellow Nitron Gretsch drums – no one was around – just me and the kit. The sound of that kit was etched in my head since I’d first heard it. I loved those drums. Dare I sit behind Tony William’s drums? Feel the response of those heads and cymbals – hear that sound, make that sound! That would be very wrong – you never play someone’s gear without a thumb’s up. So…I sat down… grabbed his sticks and started to play some time and then opened it up a little. It was blissful until… a very LARGE human screamed and warned me that I was in violation of the unwritten code of musicians everywhere. You never grab someone’s instrument without clearance. I had no clearance… so I quickly complied and planned my exit. I’m thinking, ‘salvage this thing and find a way to converse with my long-time mentor’. This is my opportunity of a ‘Lifetime’ (no pun intended) to gain some drum wisdom straight from the source – the guy that played with Miles, Herbie Hancock, Wayne Shorter and everyone else. Maybe he would comment on my playing? This was going to be great, right?! all in all, it went really well, don’t you think?